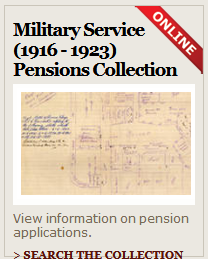 MilitaryArchives.ie has announced some details of its imminent online release from the Military Service (1916-1923) Pensions Collection. These files relate to claims lodged by the participants of the revolutionary period or by their dependents and have already yielded significant new information for period. . This will be the fourth instalment from the collection and includes the files of 1,576 individuals. In total, this instalment includes 290,000 scanned pages in 4,730 files. These files relate to claims lodged by the participants of the revolutionary period or by their dependents and contain a wealth of new and unique information for the period. 66 individuals executed during the Civil War. The names and residences of the 1,576 individuals have been published in a downloadable list (PDF 1.3Mb). The release will be on Tuesday 24 October. See details about the various record sets within the MSPC that are already online here.